In this paper we report the results obtained recently by classifying potential defects in the automated x-ray inspection of aluminium castings using statistical pattern recognition. In our classification, 71 features (e.g. area, perimeter, roundness, invariant moments, Fourier descriptors, mean grey level, several contrasts, texture features, etc.) were analysed to characterise the potential flaws. The extracted features were measured from more than 10.000 regions segmented in 56 radioscopic images (without frame averaging) of cast aluminium wheels. In addition, five statistical classifiers were tested. In a digital radioscopic image of an aluminium casting there are two classes of regions (of pixels): regions that belong to regular structures of the specimen, and regions that correspond to flaws. In the computer aided inspection of castings, we aim to make the best recognition of these two classes automatically. Usually, the pattern recognition process consists of three steps [Castleman96]: The first one is called image segmentation, in which each region is found and isolated from the rest of the scene. The second step is called feature extraction. This is where the regions are measured and some significant characteristics are quantified. The third step of pattern recognition is classification. The extracted features of each region are analysed and assigned to one of the classes (regular structure or flaw). In this paper we report the results obtained recently by analysing 71 features (e.g. area, perimeter, roundness, invariant moments, Fourier descriptors, mean interior grey level, several contrasts, texture features, etc.) measured from more than 10.000 regions segmented in 56 radioscopic images of cast aluminium wheels. In order to make a compact pattern representation and a simple decision strategy, the number of features are reduced using a Sequential Forward Selection. [Jain00]. In this selection, correlated features are omitted ensuring a small intraclass variation and a large interclass variation in the space of the selected features. A new developed contrast feature is presented, which separates the two classes at best. Additionally, five statistical classifiers (linear, threshold, nearest neighbourhood, Mahalanobis and Bayes) are analysed. In the statistical approach, each segmented region is represented in terms of the m selected features and is viewed as a point in a m- dimensional space. The objective of the statistical pattern recognition is to establish decision boundaries in the feature space which separate patterns (our segmented regions) belonging to different classes (regular structure or flaw). This will be determined by the probability distributions of the patterns belonging to each class, which must be learned. The idea of the segmentation process is to detect regions that may correspond to real defects. The segmentation is achieved using a Laplacian-of-Gaussian (LoG) kernel and a zero crossing algorithm [Mery02b,Catleman96]. The LoG-operator involves a Gaussian lowpass filter which is a good choice for the pre-smoothing of our noisy images. The binary edge image obtained should produce at real flaws closed and connected contours which demarcate regions. In order to increase the number of closed regions, pixels with high gradient are added to the zero crossing image. An example is illustrated in Fig. 1. After the edges are detected the closed regions are segmented and considered as potential flaws. Fig 1: Segmentation of potential flaws. In order to discriminate the false alarms in the segmented potential flaws a classification must be performed. The classification analyses the features of each region and classifies it in one of the following two classes: regular structure or hypothetical flaw. In this section, we will explain the features that are used in the classification. In our description, the features will be divided into two groups: geometric and grey value features. The description of the features will be made using the example of Fig. 2. Fig 2: Example of a region: a) X-ray image, b) segmented region, c) 3D representation of the grey values. Area ( A ): The area is defined as the number of pixels that are in the region. In this work the edges do not belong to the region. In our example, the area corresponds to the number of grey pixels in Fig. 2b, i.e. A = 45 . Perimeter ( L ): The perimeter corresponds to the number of pixels in the boundary of the region. There is another definition of perimeter that includes the factor between diagonal pixels of the boundary [Castleman96]. Although this definition is more precise, the computing time is more expensive. For this reason, we use the first definition. In this example L = 24 pixels. The roundness R is a value between 1 and 0. R = 1 means a circle, and R = 0 corresponds to a region without area. In our example R = 0,98 . These features are computed using the grey values in the image, where x[ i, ,j] denotes the grey value of pixel ( i, ,j) . Fig 3: Coordinates of the boundary of region of Fig. 2 and the Fourier descriptors. Fig 4: Profile x, first derivative x' and second derivative x'' of a region and its neighbourhood in i direction. G = 255 corresponds to 100% white). where x'[i, j] means the gradient of the grey value function in pixel (i, j) and l the set of pixels that belong to the boundary of the region. The number of pixels of this set corresponds to L , the perimeter of the region. Using a Gauss gradient operator in our example in Fig. 2, we obtain C = 35,47 .
where x''[i, j ] denotes the second derivative of the grey value function in pixel (i, j) . The Laplacian-of-Gauss (LoG) operator can be used to calculate the second derivative of the image. If D < 0 we have a region that is brighter than its neighbourhood as shown in Fig. 4.
for i = 1,..., 2h + 1 and j = 1,..., 2w + 1 , where h and w are the height and width as expressed in (1). The offsets ir and jr are defined as ir = - h - 1 and jr = - w - 1, where denotes the centre of gravity of the region as computed in (4). where sQ , Qmax and Qmin are the standard deviation, the maximal value and the minimal value of Q respectively. Fig. 5 shows the computation of function Q for the example given in Fig. 2. Substituting mrs by m'rs, in (6), new Hu moments f'1, L f'7 that include the grey values of the region are obtained. where denotes the mean grey value in the zone. Other texture features can be computed using the co-occurrence matrix Pkl [Castleman96]. The element Pkl [i, j] of this matrix for a zone is the number of times, divided by NT, that grey-levels i and j occur in two pixels separated by that distance and direction given by the vector (k,l) , where NT is the number of pixels pairs contributing to Pkl . In order to decrease the size Nx ´ Nx of the co-occurrence matrix the grey scale is often reduced from 256 to 8 grey levels. 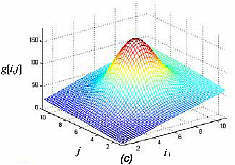 Fig 5: Computation of Q for contrast features: a) Profile in i direction, b) profile in j direction, c) fusion of profiles: Q= [Q1 Q2]. The extracted features are summarised in Table 1. The classification analyses the features of each segmented region and classifies it in one of the following two classes: regular structure or hypothetical flaw. The definitive classification of the hypothetical flaws takes place in a next step called matching and tracking [Mery01,Mery02a]. In the classification we aim to discriminate the false alarms without eliminating the real flaws. Although the methodology outlined in this section is applied to only two classes, it can be used for more classes. For instance, we can sub-classify the hypothetical flaws into the classes cavity, gas, inclusion, crack, and sponging. where wij denotes the j -th feature of the i -th feature vector, N0 is the number of the sample, and and sj are the mean and standard deviation of the j-th feature. The normalised features have zero mean and standard deviation equal to one. where N means the number of classes, pk denotes the a-priori probability of the k -th class, and are the mean value of the k -th class and the mean value of the selected features. The larger the objective function J , the higher the selection performance. Linear classifier: A linear or a quadratic combination of the selected features is used for a polynomial expansion of the discriminant function d(z). If d(z) > q then z is assigned to class 1, else to class 0. Using a least-square approach, the function d(z) can be estimated from an ideal known function d*(z) , that is obtained from the representative sample [Borner88]. Threshold classifier: The decision boundaries of class 1 define a hypercube in feature space, i.e. if the m features are located between some decision thresholds ( z'1 Ł z1 Ł z''1 and ... and z'm Ł zm Ł z''m) then the feature vector is assigned to class 1. The thresholds are set from the representative sample [Fukunaga90]. Nearest neighbour classifier: A mean value of each class of the representative sample is calculated. A feature vector z is assigned to class k if the Euclidean distance is minimal. The mean value can be viewed as a template [Fukunaga90]. The Mahalanobis classifier takes into account errors associated with prediction measurements, such as noise, by using the feature covariance matrix Ck to scale features according to their variances [Ruske88]. where p(z/k) denotes the conditional probability of observing feature vector z given class k, p(z) means the probability that feature vector z will be observed given no knowledge about the class, and pk is the probability of occurrence of class k [Fukunaga90, Ruske88]. S = 10.609 regions segmented in 56 radioscopic images of cast aluminium wheels. The images were captured without frame averaging. In this sample there were S0 = 10.533 regular structures (false alarms) and only S1=76 real flaws. After a Karhunen-Ločve-Transformation [Castleman96] we can see that the information is contained in few components as shown in Fig. 6a. This means that a feature selection must be done in order to omit correlated features. The first 15 features selected by the Sequential Forward Selection are shown in Fig. 6b. We can see, that the best single feature is the feature number 27, the new developed contrast feature K (see equation (13b)). In addition, we observe that three of the best five features correspond to the texture feature energy E30, E11, E22 (features 46, 62 and 66), obtained from equation (18) with (k,l) = (3,0), (1,1) and (2,2). Furthermore, the geometric features do not provide relevant information to separate the classes. The reason is because the regions corresponding to flaws and regular structures have similar shapes. The performance of the five explained classifiers (linear, threshold, nearest neighbour, Mahalanobis and Bayes) were tested. For each classifier, m features from the 15 recommended features were selected. The effectiveness of the classification were measured in terms of false positive or false negative errors. False positive errors refer to the case where a segmented region is assigned to class hypothetical flaw when it is a regular structure, and false negative errors refer to the case when an existing flaw is not detected. In ideal case both must be zero. Defining S0 and S1 as the number of regular structures (class 0) and real flaws (class 1) that were segmented in the sample, we have - after the classification- S0 regular structures that were classified as S00 regular structures and S01 hypothetical flaws: i.e. S0 = S00 + S01; and the S1 real flaws that were classified as S10 regular structures and S11 hypothetical flaws: i.e. Fig 6: a) KLT Analysis, b) selected features using Sequential Forward Selection (see the feature numbers in Table 1). FAR = S01/S0 and FRR = S10/S1. A classification can be tuned at a desired value of FAR. However, if we try to decrease the FAR of the system, then it would increase the FRR and vice versa. The Receiver Operation Curve (ROC) is a plot of FAR versus FRR which permits to assess the performance of the recognition system at various operating points [Jain00]. The five classifiers were manually tuned using thresholds and distance parameters [Mery01]. The results obtained for the Receiver Operation Curves are given in Fig. 7. Table 2 shows an example for each classifier, where a good performance was obtained. Table 2: Classification effectiveness FRR vs. FAR. Fig 7: ROC: False Rejected Rate (FRR) versus the False Acceptance Rate (FAR) for the evaluated classifiers. The marks ´, O, * , Ń,D mean m= 1,2,3,4,5 features respectively. Since the automated inspection of castings must be as fast as possible, we aimed to use in the classification those features which computing timing is not expensive. An interesting result was obtained using only two features, feature 27 (contrast K ) and feature 20 (mean grey value G ). The classification effectiveness of the evaluated classifiers is shown in Fig. 8. Fig 8: Classification using two features: contrast K and mean grey value G.
In this paper we propose the use of statistical pattern recognition to classify the segmented regions in a radioscopic image into two groups: regular structures and hypothetical flaws. The segmentation and the classification correspond to the first step of a method that detects flaws automatically from radioscopic image sequences [Mery01,Mery02a]. The second step tracks in an image sequence, the remaining hypothetical flaws classified in the first step. Using this second step the regular structures can be eliminated without discriminating the existing real flaws. In this first step we are not able to separate efficiently the real flaws from the regular structures as shown in the previous Section. The reason being is because we are working with noisy images that were not filtered with frame averaging. However, we think that the methodology outlined in this work can be used in other flaw detection methods, because they usually detect defects by doing a segmentation and a classification. It would be interesting to evaluate the features proposed in this paper by other detection techniques. The authors are grateful to Departmento de Investigaciones Científicas y Tecnológicas of the Universidad de Santiago de Chile, the German Academic Exchange Service (DAAD), and YXLON International X-Ray GmbH (Hamburg) for their support. [Boerner88] H. Boerner and H. Strecker: Automated X-Ray Inspection of Aluminum Casting, IEEE Trans. Pattern Analysis and Machine Intelligence,1(1):79-91, 1988. [Castleman96] K.R. Castleman: Digital Image Processing, Prentice-Hall, New Jersey, 1996. [Fukunaga90] K. Fukunaga: Introduction to statistical pattern recognition, Academic Press, Inc., Second Edition, San Diego, 1990. [Hu62] M.-K. Hu, Visual Pattern Recognition by Moment Invariants, IRE Trans. Info. Theory, IT(8):179-187, 1962. [Jähne97] B. Jähne: Digital Image Processing, Springer, 4th edition, Berlin, Heidelberg, 1997. [Ruske88] G. Ruske: Automatische Spracherkennung, Oldenburg Verlag, München  Wien, 1988. [Kamm98] K.-F Kamm: Grundlagen der Röntgenabbildung. In Moderne Bildgebung: Physik, Gerätetechnik, Bildbearbeitung und -kommunikation, Strahlenschutz, Qualitätskontrolle, K. Ewen (Ed. ), 45-62, Georg Thieme Verlag, Stuttgart, New York, 1998. [Mery01] D. Mery: Automated Flaw Detection in Castings from Digital Radioscopic Image Sequences, Dr. Köster Verlag, Berlin, (Ph.D. Thesis in German), 2001. [Mery02a] D. Mery and D. Filbert: Automated Inspection of Moving Aluminium Castings. In Proceedings of the 8th European Conference on Non-Destructive Testing (ECNDT 2002), Jun. 17-21, 2002, Barcelona, Spain. [Mery02b] D. Mery, D. Filbert and Th. Jaeger: Image Processing for Fault Detection in Aluminum Castings. In "Analytical Characterization of Aluminum and its Alloys", Editors: D.S. McKenzie and G.E. Totten, Marcel Dekker Inc., USA, 2002. [Sonka98] M. Sonka, V. Hlavac and R. Boyle: Image Processing, Analysis, and Machine Vision, Second Edition, PWS Publishing, Pacific Grove, CA, 1998.